If you know a 6-12 year old that is the Hawks biggest fan – enter below and you could WIN a Junior Mascot experience to run through the banner with the Hawks on game day in the Toyota AFL Premiership season match when Hawthorn Football Club take on Richmond on 19th May at the MCG. 4 GA tickets for you and your Junior Hawk to watch the game. To enter, tell us why a Junior Hawks fan you know is the perfect Hawks Junior Mascot and show us using emojis the key things they would bring on game day to give your team some extra luck! 1. iiNet Limited (ABN 48 068 628 937) of 63-65 Waterloo Road Macquarie Park, Sydney NSW 2113 (“we” or “us”) are responsible for conducting the “Hawthorn Coin Toss Experience Competition” (“the Competition”). 2. By entering into this Competition you agree to these Terms and Conditions. 4. The Competition commences at 00:01 AM AEDT on Thursday 11th April 2019 and closes at 11:59 PM AEDT on Sunday 28th April 2019 (“Competition Period”). 5. Entries must be received by us within the Competition Period. 6. Entry is open to Australian residents in Victoria aged eighteen (18) years old or over at the date of entry. Employees (and their immediate family) of iiNet Limited, Hawthorn Football Club and the TPG Telecom Group are ineligible to enter. 8. You can enter as many times as you like during the Competition Period, just make sure your Facebook, Instagram or Twitter account settings are public so we can see your post. 10. You warrant that each Entry is an original work created solely by you, that the Entry does not infringe on the copyrights, trademarks, moral rights, rights of privacy/publicity or intellectual property rights of any person or entity and that no other party has any right, title, claim, or interest in the Entry. 11. We reserve the right to check the validity of all Entries and to disqualify you if we reasonably believe that your entry does not comply with these Terms and Conditions or the Entry process has been tampered with. 12. Entries that are considered, in our absolute discretion, to be incomplete, incomprehensible, unlawful, defamatory, abusive, obscene, sexist, racist or otherwise inappropriate will be deemed invalid and rejected. We reserve the right to provide law enforcement bodies with the objectionable Entry and the Entrant’s personal information. 13. Entrants must be over eighteen (18) years of age but the Winner will need to allocate the Junior Hawks run through experience and Junior Hawks uniform to a Hawks fan between the ages of six (6) and twelve (12) years old (“Junior Hawk”). 14. The Competition is a game of skill. Chance plays no part in determining the winner[s]. Each Entry will be judged according to its originality and creativity. 15. 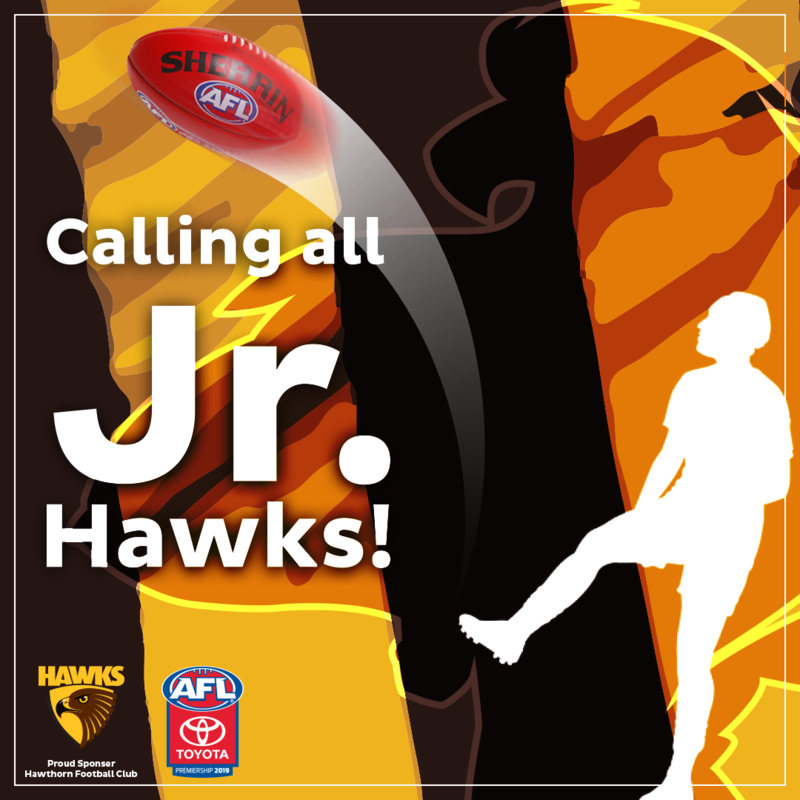 The one (1) Entry (“Winner”) determined by us to be the most original and creative from the Entries received during the Competition Period will win a Junior Hawks experience with the Hawthorn Football Club (“Prize”). 16. The Prize consists of a Junior Mascot experience for your Junior Hawk including running through the banner with the team before the game; one (1) Junior Hawks kit comprised of a Hawks Guernsey, a pair of shorts and a pair of socks; and four (4) General Admission tickets for your Junior Hawk, their parent/guardian aged 18 years or older and two mates to watch Hawthorn take on the Richmond on 19th May at the Melbourne Cricket Ground. The Prize is valued at approximately $2,564 incl GST. 17. The Winner will be determined at Level 1, 502 Hay Street Subiaco WA 6008 on the 29th April 2019 at 2pm AEDT. 18. The Winners will be notified 30th April 2019. The Winner must claim their prize by 5pm AEDT. 2nd May 2019 or they will forfeit the prize and will no longer be the Winner. The Entry judged by us to be the next best Entry will become the winner (“Replacement Winner”). If the Replacement Winner does not claim their prize within two (2) business days of our notification, that Replacement Winner will forfeit the Prize. 19. If the Prize is forfeited by a winner (for whatever reason), we may conduct further judging until a Replacement Winner is successfully contacted by us and awarded the Prize. 20. Our decision on all aspects of this Competition is final and no discussion or review will be entered into. 21. There is a total of one (1) Prize. The total prize pool is valued at approximately $2,564 incl GST. 22. The Prize does not include any other costs or expenses such as accommodation or transport to and from the matches. The Winners must make their own arrangements to attend the matches. 23. The Prize is awarded “as is” and is not transferable or exchangeable for cash. Any unused or unclaimed portion of the Prize will be forfeited. If any element of the Prize becomes unavailable, we reserve the right to substitute that element with another prize of equal or similar value. 24. We may require that a Winner provide acceptable identification before awarding the prize. 25. We are not responsible for any failure or inability on the part of any Winner to redeem the prize. 26. The allocation of the four (4) GA tickets must include one (1) allocation to the Junior Hawk and a second allocation to a parent or guardian over the age of eighteen (18) years old for the Junior Hawk. 27. By entering this competition you agree to us collecting, using and/or disclosing your personal information for the purposes of the competition. We will handle your personal information in accordance with our privacy statement which is available at http:www.iinet.net.au/about/legal/competitionprivacy.html. 28. You agree to us publishing your name and entry (and, if requested, a photograph of you), free of charge, in any media (including social media) for the purpose of promoting this competition and/or our products. 29. We recognise that you retain ownership of the copyright in each of your entries. You grant us a perpetual, non-exclusive, irrevocable licence to use the entry in all media throughout the world for marketing and promotional purposes in connection with the competition. 30. We reserve the right to suspend, cancel or modify the competition if necessary, due to circumstances beyond our reasonable control. We will take reasonable steps to notify you of any such change. 31. Nothing in these Terms and Conditions limits, excludes or modifies the consumer guarantees provided under the Competition and Consumer Act (2010) or any other statutory rights that you have that cannot lawfully be excluded. 32. To the extent permitted by law, we exclude and you irrevocably release us and our employees and contractors from, all liability for any loss or injury suffered by you in connection with your participation in the Competition or any of your activities in connection with any prize that you win as a result of your participation in the Competition, except where such loss or injury is caused by our gross negligence. 33. We are not responsible for any incorrect or inaccurate information, either caused by promotional website users or by any of the equipment or programming associated with or use in this Competition, or by any technical error that may occur in the course of the administration of this Competition. We are not responsible for any error, omission, interruption, deletion, defect, delay in operation or transmission, communications line failure, theft or destruction or unauthorised access to or alteration of Entries. 34. These Terms and Conditions are governed by the laws of New South Wales. My 9 year old bleeds Brown and gold.Started AFL Auskick in Fiji while we stayed there for 3 years and convinced most people to follow Hawks..
P.S Look out for the Cats this year! P.P.S You should win because you have booted loads of goals! Even after today’s close call-Sonny (who is 8) was a loyal supporter screaming out constant encouragement to the players while also applauding the opposition when they played the game better than the Hawks! He would love to win this prize! Connor is 6yo and has two loves other than his family , the game of football and his beloved hawks . James Sicily is his cavities player and recently asked his barber for a James Sicily hair cut. His emotions on game day are hilarious riding every high and low with his favourite players. I think Hawkies are the best and will win the grand final . It would be pretty awesome to run out on the ground with my bestest players roughy, Sicily and big boy. I will cheer so loud when I win and gets the guys all pumped up for the game. I’ve got spark ⚡️ I’ve got passion for the brown and gold , I bring my attitude, I bring my ❤️ for the hawks and game, I’ll bring excitement, I’ll even bring my shoes. I’ll bring my and , and I’ll even bring my ‍♂️‍♂️. Premiership since I was born. I know there’s plenty more where they came from. Go Hawks. Hawks are the best team and I have been a member of the hawks my entire life. I played footy for under 12 and I was one of the only girls. I have always wanted to play for a Hawks womens team and I would love to run out with the Hawks. I will cheer with all of my heart and I would love to have the privilege of running out with the hawks and my favourite plyers Impey, Wingard and my all time favorite Roughy. My 9 year old son (Harrison Franklin) would be BEYOND excited to be the Hawks Junior Mascot when we take on Richmond. He wouldn’t stop cheering for his beloved Hawkers and encouraging them on game day at the G . He might even cry tears of joy at being given such a cool experience, then once the emotions passes he will be jumping up and down like a rabbit with stars in his eyes as he gets up close to his heroes. Go Hawks! My 10yr old son Ryder would love this experience, he was born a hawks supporter. Our family is very fortunate that his Dad, Uncle, his sister and himself all born the years hawthorn won premierships he loves the footy and I know would be very great full to win and run through that banner!!! My 6 year old son Dylan is the biggest hawks fan. At the age of 3 Dylan could name about 95% of the hawks players. He cried when rioli left. He watches every hawks game. My 8 Yr old son Spencer is a massive hawks fan like his dad. He loves playing Auskick every week and was able to be part of last yrs grandfinal parade and play at half time which was amazing. He also was chosen to play half time on good Friday bombers and roos game and had a ball. He loves the big stage and one day would love to play for the hawlks in a grandfinal. Piper who has just turned 7 love her hawks, poppy is her favorite playing. She is huge fan who always yells at the tv and every time poppy scores yells out yay poppy. She never been to a game but would love too, it would make her dreams come true. My little hawks fan has been kicking his footy since he could walk. He would love this experience and would be so appreciative. He would love to come watch the game with his mum to. My little man has been kicking the ball since he could walk. He would run through that banner with enthusiasm and excitement ‍♂️. This would make his year.